"TopCoder(R), Inc., the leader in online programming competition, skills assessment and competitive software development, today announced the opening of registration for a new $50,000 contest to develop new and innovative algorithms to aid the US Patent and Trademark Office (USPTO) in patent review." "After spending more than 240 days "sailing" around the Earth, NASA's NanoSail-D -- a nanosatellite that deployed NASA's first-ever solar sail in low-Earth orbit - has successfully completed its Earth orbiting mission. Launched to space Nov 19, 2010 as a payload on NASA's FASTSAT, a small satellite, NanoSail-D's sail deployed on Jan. 20. The flight phase of the mission successfully demonstrated a deorbit capability that could potentially be used to bring down decommissioned satellites and space debris by re-entering and totally burning up in the Earth's atmosphere. The team continues to analyze the orbital data to determine how future satellites can use this new technology." "For a variety of reasons, we had to postpone the ARCTek meeting. We have now rescheduled it for Wednesday, Jan. 18, at 8:30 a.m. to 12:30 p.m. in Building 152 (opposite Chase Park). Our planned format remains the same: Center Director Pete Worden will set the stage with a short overview of national and agency technology goals and priorities. Steve Zornetzer, the Associate Center Director (Technical) will illuminate some of the ways the Center is currently restructuring to meet those priorities. And the org directors will share their insights into the NASA mission directorates' technology needs and directions, their thoughts on how the Center might be able to support these, and what the Center needs to do in order to position itself to do it." "Taking the main stage before more than 8,000 attendees at Autodesk University 2011, Edwin "EJ" Sabathia of the "Moon Express Robotics Lab for Innovation" (MERLIN) unveiled lunar micro-rovers designed with Autodesk software. EJ was one of eight student robotics engineers hired by Moon Express in September from a team of the nations' brightest engineering students. MERLIN is utilizing Autodesk design software for developing robotic technology supporting the company's lunar exploration missions." "NASA launched apps@NASA, a website where NASA employees and contractors can download mobile apps that securely access NASA systems. These apps enable our users to perform critical job functions at anytime from anywhere via personal and NASA mobile devices. This is part of a full suite of services that is provided by the NASA Enterprise Applications Competency Center (NEACC). The NEACC resides at NASA's Marshall Space Flight Center in Huntsville, Alabama. It is supported by SAIC under the Enterprise Applications Service Technologies (EAST) contract of our Information Technology (IT) Infrastructure Integration Program (I3P). The NEACC's role is to help NASA improve business processes and to deploy enabling technology needed to implement our Agency's strategic plan." "The objective of ISS NLEP is to strengthen a link between the unique venue of the space station and science, technology, engineering and mathematics, or STEM, education. The objective of the workshop is to bring together researchers, academicians and interested parties for discussions on upcoming opportunities." "Pulsars are rapidly rotating neutron stars that are observable as variable celestial sources of electromagnetic radiation. Their periodic signals have timing stabilities comparable to atomic clocks and provide characteristic temporal signatures that can be used as natural navigation beacons, quite similar to the use of GPS satellites for navigation on Earth." Keith's note: This is the plaque placed on the Voyager 1 and 2 probes, now heading out of our solar system into interstellar space. 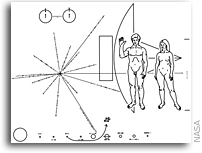 According to Wikipedia: "The drawing in the lower left-hand corner of the cover is the pulsar map previously sent as part of the plaques on Pioneers 10 and 11. It shows the location of the solar system with respect to 14 pulsars, whose precise periods are given." "NASA engineers have produced a material that absorbs on average more than 99 percent of the ultraviolet, visible, infrared, and far-infrared light that hits it -- a development that promises to open new frontiers in space technology. The nanotech-based coating is a thin layer of multi-walled carbon nanotubes, tiny hollow tubes made of pure carbon about 10,000 times thinner than a strand of human hair. They are positioned vertically on various substrate materials much like a shag rug." "The NASA workforce is hungry for ways to improve collaboration. Wikis can help--and are helping--to do that. These powerful tools exist at every NASA center and across many levels of organizations, from wikis running on a temporary server for a team of five to others for the benefit of an entire field center. There are grassroots, bottom-up systems, originating to meet a particular need for a specific project or group. There are top-down institutional systems, provided for the benefit of a larger organization. Among other uses, they are helping project managers promote better communication within their teams, and engineers collaboratively document the results of their work." More at open.NASA. "Scientists routinely use computer modeling and computation in innovative research, including predicting the nature of He4 at extremely low temperatures and the impact of human activity on climate. Why does computer-based modeling remain absent from many educational programs? The Open Source Physics (OSP) project, www.compadre.org/osp/, seeks to enhance computational physics education by providing a central Web site containing computer modeling tools, simulations, curricular resources such as lesson plans, and a computational physics textbook that explains the pedagogic simulations' algorithms (1). Our resources are based on small single-concept simulations packaged with source codes that can be examined, modified, recompiled, and freely redistributed to teach fundamental computational skills. Students at all levels will benefit from these interactive simulations by learning to question and assess the simulation's assumptions and output." "CSSS 2012 will be held in Istanbul, Turkey. The first goal of this conference is to provide a selective and interdisciplinary forum for research in Small Satellites Systems. The second goal is to provide a remarkable opportunity for the academic and industrial community to address new challenges and discuss future research directions in the area of small satellites. The third goal is to give the young participants a chance to meet experienced professors and experts from the industry." Hello Campuseros: As you know, the launch of the spacecraft Curiosity at Cape Canaveral has been delayed, and NASA cannot rule out another change of schedule. In light of this change, we are pushing back the launch of the website for Campus Party, the Silicon Valley Tech Festival. The release will now take place on December 1st at NASA's Ames facility, where Campus Party will be held. We will announce the winners of the #becampusero contest, where one winner and two friends will win an ell expenses paid trip to #cpsiliconvalley, in a live streaming of #geekvibrations. 2) On December 1st, between 1pm and 5pm (local EST time Florida, USA. GMT -5) send a tweet that says "I want to go to #CPSiliconValley because I'm a campusero, are you? #becampusero www.campus-party.org"
The winner will get the two trips, and one "extra" for the person who reported the promotion. Therefore, if you help us by telling all your friends and encouraging them to participate, you will have many more chances to win. Hurry up and ask all your friends to put on the helmet and send a campusero tweet on the 1st. See you in Silicon Valley! "NASA's Office of Education will host the second Education Stakeholders' Summit Nov. 29-Dec. 2 in Chantilly, Va. The summit's theme is "An Innovative Solution for the STEM Workforce of Tomorrow." A major conference focus will be the One Stop Shopping Initiative (OSSI). The program's goal is to build a robust NASA infrastructure for attracting students and facilitating their entry into the NASA workforce through a variety of internships, fellowships and scholarships." 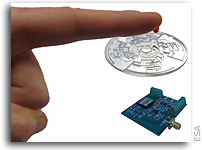 "We present the design, construction and in vivo rabbit testing of a wirelessly powered contact lens display. The display consists of an antenna, a 500 × 500 µm2 silicon power harvesting and radio integrated circuit, metal interconnects, insulation layers and a 750 × 750 µm2 transparent sapphire chip containing a custom-designed micro-light emitting diode with peak emission at 475 nm, all integrated onto a contact lens. The display can be powered wirelessly from ~1 m in free space and ~2 cm in vivo on a rabbit. The display was tested on live, anesthetized rabbits with no observed adverse effect. 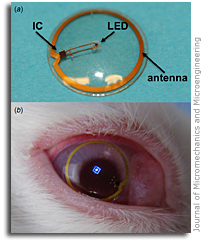 In order to extend display capabilities, design and fabrication of micro-Fresnel lenses on a contact lens are presented to move toward a multipixel display that can be worn in the form of a contact lens. Contact lenses with integrated micro-Fresnel lenses were also tested on live rabbits and showed no adverse effect." "It has finally been done: A team of US and Finnish bioengineers have embedded an antenna, radio receiver, control circuitry, and LED into a wearable contact lens. If you're a rabbit, you can hop along to their research lab at the University of Washington, Seattle, and try it out right now -- but if you're a human, you'll still have to wait a couple more years for the bionic, Terminator-like HUD of your dreams." Think about this: Imagine having this system instead of the Heads Up Displays currently used to land spacecraft. Or if you are doing an EVA in space or are out on the surface of the Moon? You could use augmented reality apps and "see" overlays of maps on terrain ahead of you, schematics of things in front of you, system status without the distraction of averting your gaze to a screem, or frequencies your eyes normally do not see. It could be like have Geordi's Visor - without the visor. When most people think of the New York City underground, the subway, rats and bad lighting are among the first things that come to mind. But, how about beautiful spaces with natural sunlight, grass, trees and remarkably good-looking people relaxing in a park-like setting? Well, that's exactly what pops into the heads of architect James Ramsey and his partner Dan Barasch. The pair want to turn the rundown, graffiti-covered trolley terminal under Delancey Street into an underground park ... While the plan may seem far-fetched to some, Ramsey and Barasch appear to be the right men for the job. Their resumes include words like "NASA," "Yale," "Cornell" and "Google." 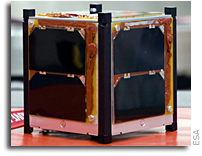 "The UK space Agency and Astrium have just approved the final design of UKube-1 - the UK's first CubeSat mission. On Thursday and Friday last week (3rd and 4th November 2011), a young team of engineers from Clyde Space presented their final design to a team of experts for the Critical Design Review (CDR) - the typical 'gateway' for space missions to proceed into the flight build and implementation phase. The CDR for Ukube-1 thus marks an important point in the development of the mission, establishing the robustness of the design, the level of technical risk and the schedule/resourcing for the completion of all the tasks to build the flight spacecraft." "Following the LaunchPad event, Dr. Holdren paid a visit to NASA's Glenn Research Center where scientists and engineers work on, among other things, novel space-technology research to further America's capabilities in space. These Federal research efforts also have the potential to translate into new commercial products and industries, enabling new businesses and innovations." "NASA, Cheltenham Festivals (UK) and the Blue Marble Space Institute of Science (BMSIS) are pleased to announce a partnership to operate a FameLab competition for the first time. The competition will be held in the fields of astrobiology and planetary sciences, and is open to all scientists working in these diverse areas of research. FameLab Astrobiology workshops will train scientists and engineers to convey complex scientific concepts to the public. The training, coaching and recognition provided by these events builds the confidence needed to apply communication skills in a wide variety of situations." "Two NASA California centers have been selected to develop new space-aged technologies that could be game-changers in the way we look at planets from above and how we safely transport robots or humans through space and bring them safely back to Earth. NASA's Jet Propulsion Laboratory in Pasadena, Calif., will use advanced compound semiconductor materials to develop new technologies for the High Operating Temperature Infrared Sensor Demonstration. Seeking to radically change the way heat shields protect spacecraft during atmospheric entry, NASA's Ames Research Center at Moffett Field, Calif., is developing the Woven Thermal Protection System." "NASA successfully completed the final flight in a series of tests of a new robotic lander prototype at the Redstone Test Center's propulsion test facility on the U.S. Army Redstone Arsenal in Huntsville, Ala. Data from this test series will aid in the design and development of a new generation of small, smart, versatile robotic landers capable of performing science and exploration research on the surface of the moon or other airless bodies in the solar system, such as asteroids or the planet Mercury." Ten Startups. Three Months. Unlimited Innovation. "If you are a developer or existing team/startup focused on building a business that takes advantage of the Kinect and Natural User Interface technologies, then the Kinect Accelerator is where you need to be. Through this program, Microsoft is supporting entrepreneurs, engineers and innovators like you to bring to life a wide range of business ideas that leverage the limitless possibilities Kinect enables. Following a competitive screening process, ten finalists will be chosen for this unique three month incubation program running from March to May, 2012 in Seattle, WA. The Kinect Accelerator is "powered by TechStars" using the same mentor-driven methodology pioneered and proven in New York, Boulder, Seattle and Boston. Mentors for the Kinect Accelerator include a broad base of entrepreneurs and venture capitalists in the industry as well as executives from Microsoft Studios, XBOX, Microsoft Research and other Microsoft organizations. What the program offers: Every company participating in the Kinect Accelerator will receive an investment of $20,000, an Xbox development kit, the Windows Kinect SDK, office space, all the resources of BizSpark, technical training and support, and mentorship from entrepreneurs, investors and Microsoft executives intensely focused on making their business a success. At the end of the program, each company will have an opportunity to present at an Investor Demo Day to angel investors, venture capitalists, Microsoft executives, media and industry influentials." Think about this: How about a Kinect-based Robonaut Interface? "On November 3rd, surprisingly, a bill was passed by the House of Representatives with strong bipartisan support. The Entrepreneur Access to Capital Act aims to make it easier for small businesses to raise money through "crowdfunding". For the first time ordinary investors would be allowed to put up to $10,000 in small businesses that are not registered with the Securities and Exchange Commission, enabling Joe Schmo to win big if the company becomes the next Google." "Entrepreneur Access to Capital Act - Amends the Securities Act of 1933 to exempt from the prohibitions against use of interstate commerce and the mails for sale or delivery after sale of unregistered securities, including unregistered security-based swaps, any transactions involving the issuance of (crowdfunded) securities for which: (1) the aggregate annual amount raised through such issue is $5 million or less; and (2) individual investments in the securities are limited to an aggregate annual amount equal to the lesser of $10,000, and 10% of the investor's annual income. Authorizes an issuer to rely upon certifications provided by investors. Amends the Securities Exchange Act of 1934 to exclude persons holding crowdfunded securities under this Act from application of "held of record" requirements with respect to mandatory registration of securities. Amends the Securities Act of 1933 to exempt such crowdfunded securities from state regulation of securities offerings." "The U.S. House advanced legislation this week that would make it easier for smaller companies to raise money from investors. House lawmakers, in overwhelming bipartisan votes, completed work Thursday on four bills as the measures drew interest in the Senate. President Barack Obama also signaled support for at least one of the bills. Among other things, the House by a vote of 413-11 approved a bill to make it easier for companies to advertise private offerings with wealthy investors and voted 407-17 to allow startup companies to raise up to $10,000 from individuals over the Internet." "At San Francisco's St. Francis Yacht Club, Liquid Robotics(R), an ocean data services provider and developer of the first wave-powered Wave Glider(R) ocean robot, launched four Liquid Robotics' Wave Glider ocean robots on a record-setting journey across the Pacific Ocean -- the longest distance ever attempted by an unmanned ocean vehicle. The purpose of this unprecedented PacX (Pacific crossing) voyage is to foster new scientific discoveries in ocean science by making available vast amounts of ocean data collected and transmitted globally during the Wave Gliders' yearlong journey. Liquid Robotics and Ocean in Google Earth are providing a platform for the world to follow the expedition virtually, while Virgin Oceanic and Liquid Robotics will jointly explore the Mariana Trench." "Here's a video from a camera on Xombie looking down at the ground during a pad-to-pad flight that you might recognize as almost identical to the flight path flown during the Lunar Lander Challenge. In this case, we had about 60 lbs of payload at the top of the vehicle and she handled it with ease!" "The process of establishing the world's first operational lunar base and propellant depot business in space is underway as SEC launches its initial fundraising campaign. This comes in the footsteps of recent amazing new discoveries of huge deposits of propellant-feedstock ice on the Moon by NASA and other international space programs. Joining forces with RocketHub, one of the largest crowdfunding platforms, SEC seeks to raise the initial seed capital necessary to complete its top level planning in order to then secure the first major round of investment capital necessary to complete preliminary designs of all system elements." "Jobs for the Future (JFF) and the National Wildlife Federation (NWF) are introducing NASA's cutting-edge contributions in climate change science to community college green sector curricula as part of a new project launched this month called Building a Diverse, Green Workforce. The project builds on The Greenforce Initiative, a partnership between JFF and NWF to improve green career pathways for underrepresented students and connect campus sustainability to hands-on training opportunities. The National Center for Science Education (NCSE) is also a partner in the new project." "NASA's Office of Education is collaborating with a variety of organizations this week to engage students in science, technology, engineering and mathematics (STEM) education and increase academic excellence. Leland Melvin, the agency's associate administrator for education, is the keynote speaker today at the inaugural STEM Summit in St. Louis. The summit is sponsored in part by LEGO Education. NASA and the maker of the iconic building bricks have partnered on a number of events in recent years to encourage hands-on creativity as an avenue for learning STEM principles." "The first CubeSats to be sponsored by ESA's Education Office have been delivered to the agency's Space Technology and Research Centre (ESTEC) in the Netherlands. The ESA CubeSat programme began on 28 May 2007, when Antonio Fabrizi, the Director of Launchers, and Rene Oosterlinck, the Director of Legal Affairs and External Relations, signed an agreement to include an educational payload on the maiden flight of the Vega launch vehicle. The announcement of opportunity issued by ESA's Education Office in February 2008 offered the possibility of launching up to nine university CubeSats free-of-charge on Europe's newest launcher." "NASA's 2010 CubeSat Launch Initiative Competition has been awarded a launch slot to the Vermont CubeSat Lunar Lander Project. Faculty and students from Vermont Technical College, Norwich University, UVM and St. Michael's College are developing the satellite for this launch opportunity. It will be launched into Low Earth Orbit as part of a NASA launch payload in 2012. The single-unit CubeSat for this launch will perform critical on-orbit testing of the robotic navigation system that will autonomously guide the eventual three-unit CubeSat Lunar Lander package into a lunar orbit, followed by a landing on the Moon." "Administered by the National Science Foundation (NSF), the Presidential Award for Excellence in Science, Mathematics and Engineering Mentoring is awarded by the White House to individuals and organizations in recognition of the crucial role that mentoring plays in the academic and personal development of students studying science and engineering--particularly those who belong to groups that are underrepresented in these fields. By offering their expertise and encouragement, mentors help prepare the next generation of scientists and engineers while ensuring that tomorrow's innovators reflect and benefit from the diverse talent of the United States." "NASA is kicking off its second annual NASA OPTIMUS PRIME Spinoff Video Contest to raise student awareness of how NASA technologies provide benefits to the public. Registration for the contest is open until January 3, 2012." "A team of current, past and future University of Central Florida students will float around in weightlessness like astronauts this month as part of a physics experiment that could provide valuable information for future trips to the Moon or asteroids. UCF Associate Professor Josh Colwell is leading a team of students on a Zero-G flight on a specially modified Boeing 727 on Nov. 20. The students will be manning several experiments during the flight, which departs from Titusville municipal airport at 10 a.m."
Space Droids Using Sign Language? Keith's note: I have seen Robonaut-2 in action and its dexterity is interesting - and rather facile. So ... how could NASA demonstrate this dexterity in new ways, make it a little more "human" or approachable, - and reach a new segment of the populace that is normally overlooked? Program it to use Sign Language. Background: I worked for more than a decade as a professional certified (educational) sign language interpreter. This idea occurred to me when I was looking at this picture and instantly wondered what Robonaut-2 "wanted" or why it was seemingly in the process of saying "here" or maybe "give". Imagine how fast a video of Robonaut-2 saying something in American Sign Language from space would go viral. NASA could have a competition wherein people submit questions for it to answer. NASA already has a signing astronaut and SMD and NLSI already put out books in Braille. Just a thought. P.S. Maybe he could repeat what that alien signed in "Close Encounters of the Third Kind" (video). I first saw this film when it came out with my hearing impaired roommates - none of us knew that aliens were going to sign so we all freaked out when one of them did. Of course, it was natural to us that all aliens would know how to sign - since they all already speak English, right? Do You Want To Be A NASA Astronaut? "Do you dream of flying in space? Now is your chance. NASA is accepting applications for the agency's next class for the Astronaut Candidate Program. Starting today, qualified individuals can submit their applications through the federal government's USAJobs.gov website. Those selected will be among the first to pioneer a new generation of commercial launch vehicles and travel aboard a new heavy-lift rocket to distant destinations in deep space." Help Fund "The Astronaut's Secret"
"They never told me to keep it quiet but I knew if I told the world I had Parkinson's that would put Nasa in a bad place. It would make press conferences all about me, it would raise questions." "What is "The Astronaut's Secret"? "The Astronaut's Secret" will be a 60 minute documentary about the life of Astronaut Rich Clifford. It will uncover how he and NASA kept his Parkinson's Disease a secret for 17 years, explore the impact of the end of the Shuttle Program on Rich's life, and follow him as he speaks nationwide about the importance of Early Detection of Parkinson's Disease." Keith's note: NASA Watch readers need to fund this project. I have pledged $100. Rich has a compelling story to tell. Help him tell it. "By 2020, Shackleton Energy Company (SEC) intends to become the world's foremost space-based energy company providing rocket propellants, life support, consumables, and services in Low Earth Orbit (LEO) and on the Moon to all spacefarers. The company will use a mix of industrial astronauts and advanced robotic systems to provide a strategically-assured, continuous supply of propellants to already-defined customers in space. Critical to the success of this operation is the prospecting for and mining of ice located within deep, inhospitable, ultra-cold craters at the polar regions of the Moon." "The goal of ALASA is to develop a significantly less expensive approach for launching small satellites routinely, with a goal of at least threefold reduction in costs compared to current military and US commercial launch costs. ALASA seeks to develop and employ radical advances in launch systems, to include the development of a complete launch vehicle requiring no recurring maintenance or support, and no specific integration to prepare for launch." "Mason Peck 's interest in chipsats, and an experiment called Sprite, might be even more radical. These satellites pack all the communication and navigation capabilities they need onto a chip the size of a dime; for fuel, they can simply ride on the wave of the solar wind, like a miniature solar sail. Right now, Peck has a few Sprites being tested on the space station, but he foresees all sorts of future uses: clusters of chipsats, stationed at the Earth-Sun Lagrangian point, for monitoring dangerous outbursts of Solar wind; a benign chipsat cloud surrounding larger spacecraft to serve as inspectors and sentries; or an armada of chipsats, sent plunging into the atmosphere of an outer planet, in order to return basic physics and chemistry data." 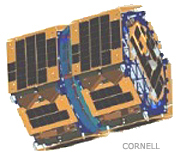 "At Cornell, Peck is the principal investigator on the CUSat in-orbit inspection technology demonstration, a pair of satellites the university has built that are scheduled to launch in 2013 on a Falcon 9 rocket through the U.S. Air Force Research Laboratory's University Nanosatellite program." "The American Society for Gravitational and Space Biology (ASGSB), a U.S. non-profit 501(C)(6) scientific society, announces today an agreement has been signed with Nanoracks (Houston, Texas) to fly a student space >light experiment on-board the NASA International Space Station (ISS). NanoRacks is an industry leader in low-earth orbit space services http://nanoracks.com/. NanoRacks, LLC is working with NASA under a Space Act Agreement for the use of the U.S. National Lab. ASGSB has entered into an agreement with NanoRacks as a result of an industry partnership agreement with the Science and Technology Corporation (STC). STC is a small, high-technology company that has experience in nano-satellite and space instrument development." "This call for graduate fellowship applications solicits applications from accredited U.S. Universities on behalf of highly qualified individuals pursuing or planning to pursue Master's (e.g., M.S.) or Doctoral (e.g., Ph.D.) degrees in relevant space technology disciplines at their respective institutions. This call is open to students pursuing advanced degrees in Science, Technology, Engineering and Mathematics (STEM). The goal of NSTRF is to provide the Nation with a pipeline of highly skilled engineers and technologists to improve America's technological competitiveness. NASA Space Technology Fellows will perform innovative space technology research while building the skills necessary to become future technological leaders." "NASA has opened registration for the 2011 OPTIMUS PRIME Spinoff Video Contest. Featuring OPTIMUS PRIME, the leader from the popular TRANSFORMERS brand, the contest highlights spinoffs from NASA technologies that are used on Earth. The goal is to help students understand the benefits of NASA technology to their daily lives. Last year's contest was open to students in grades 3-8 and resulted in 76 video submissions from over 190 students in 31 states." "More than two thirds of spiral galaxies, including our own Milky Way, display a central bar that can extend for thousands of light years. These colossal elongated structures are made up of collections of stars and dark matter which are held together by gravity. Now a team of researchers from Europe and the USA have measured the bar length of some 5000 galaxies with the help of amateur astronomers. The most precise results (those obtained for 3150 galaxies) have been published in the Monthly Notices of the Royal Astronomical Society journal." "NASA has postponed Friday's 10:30 a.m. CDT 100-foot robotic lander altitude flight test to allow engineers more time to assess data from a recent test regarding an issue with the vehicle's propellant usage. The test now is targeted for no earlier than Friday, Nov. 9, from the U.S. Army Redstone Arsenal in Huntsville, Ala. On Thursday, managers from the Robotic Lander Development Project at Marshall Space Flight Center in Huntsville, Ala., decided that more time is needed to analyze the test data to confirm the vehicle's propellant rate usage." "Astronomy is already awash with data: currently 1 PB (petabyte) of public data is electronically accessible, and this volume is growing at 0.5 PB per year. The availability of this data has already transformed research in astronomy, and the STScI (Space Telescope Science Institute) now reports that more papers are published with archived data sets than with newly acquired data. This growth in data size and anticipated usage will accelerate in the coming few years as new projects such as the LSST (Large Synoptic Survey Telescope), ALMA (Atacama Large Millimeter Array), and SKA (Square Kilometer Array) move into operation." "The Nano-Satellite Launch Challenge is to launch satellites with a mass of at least 2.2 pounds (1 kg) into Earth orbit, twice within the span of one week. The new challenge has a NASA-provided prize purse of $2 million. The objective of the competition is to encourage innovations in propulsion and other technologies, as well as operations and management relevant to safe, low-cost, small payload delivery system for frequent access to Earth orbit. Innovations stemming from this challenge will be beneficial to broader applications in future launch systems. They may enhance commercial capability for dedicated launches of small satellites at a cost comparable to secondary payload launches -- a potential new market with government, commercial, and academic customers." "NASA has won a GreenGov Presidential Award from the White House Council on Environmental Quality. The GreenGov awards celebrate exceptional efforts to promote sustainability in federal agency operations. NASA is being recognized in the "Lean, Clean and Green" category for consistently moving toward sustainable and efficient operations by setting exemplary goals in agency-wide energy and water efficiency, reduced emissions, and greater renewable energy usage. Several of NASA's sustainability solutions address the communities where agency facilities are located." PETMAN is an anthropomorphic robot developed by Boston Dynamics for testing special clothing used by the US Army. PETMAN balances itself as it walks, squats and does simple calisthenics. PETMAN simulates human physiology by controlling temperature, humidity and sweating inside the clothing to provide realistic test conditions. PETMAN development is lead by Boston Dynamics, working in partnership with Measurement Technologies Northwest, Oak Ridge National Lab and MRIGlobal. The work is being done for the US Army PD-CCAT-TI. "Join Challenger Center for Space Science Education on Thursday November 10th, 2011 at 1:00pm (Eastern Time) for a live interactive webcast with former NASA astronaut Frederick Gregory. The interview is part of an exciting series of interactive webcasts celebrating the 25th anniversary of Challenger Center's educational programs."